Stay in this elegant residence and enjoy luxurious design by Fendi, an early 19th-century historic setting and a central location in Rome, just 500 metres from the Lepanto Metro station. Walk to Piazza del Popolo in just 15 minutes from Villa Laetitia. You will be near the Tiber River and within easy reach of the Vatican City. Admire individually designed rooms by Anna Fendi, one of the 5 sisters of the Fendi fashion industry. 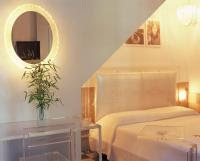 Choose from double rooms to the more spacious suites, which are also equipped with kitchenettes. Villa Laetitia provides accommodation with balconies or patios overlooking the garden. Free internet is available in all room types. Relax in Villa Laetitia’s quiet garden. You will be in a residential area surrounded by a wide variety of restaurants and businesses. Organise a business breakfast at Villa Laetitia, where you will find a warm, inviting atmosphere and professional staff.